I am using HSD in my swift and I have clocked nearly 20K kms. No smoke and no issues I have noticed. Engine is quite refined and fine going.There is no reason why some dealers are misguiding customers this way.my dealer here says u cannot use synthetic oil for diesel engines and for petrol its advisable and u can change oil once in 40k kms! Sounds great but it will not work. So don believe ur dealers words fully and keep in touch with ppl who use it regularly.. I really love hearing this news. Go India! Go!! @ sb-alto: are you sure that for cars the brake oil needs to be changed in 15000 kms? Different grades are used by auto manufactures. Outer sheets are CRCA where as door hinges are some times made with GI.BS 1449 is one such grade. Thickness of the sheets will range from .8 to 2.5 mm. So the combination will go from bare min of 1.6mm to 5 mm in joineries. Normally thinner sheets are used in outer skin panels and thicker sheets are used in Under body, and other reinf areas. Thinner sheets facilitates easy repair so they are used in exterior areas. but Nano has a monocouqe body where as Ace has a body on Chase? Can you plz explain for me to understand the synergy between these two body types. I believe that should be a higher version of Ace. where did u shot this. I feel these performance kits can be fitted only with experiece and not just like an add on fitments. This needs some hands on experience with vehicle as well as with the kit. So with out this, it will certainly affect the performance of the vehicle. So think twice before you invest in such kits. what was your 1st VEHICLE??? My first vehicle (of course a 2 wheeler) was a TVS XL Super in my school days.This was gifted by my mother on the eve of Millenium(2000) ie exactly at Midnight 12. The keys were handed over at 12 in show room. This was a special request from my mother which was agreed by the dealer and he told it was a different experience for them too. Next was a TVS Fiero. This was the first vehicle in my town and delivery was taken into records of the company. 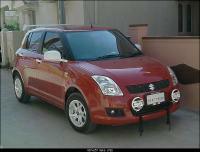 Now I am driving Swift. But before that my driving started with Amby's, Fiat which was there in my home when I was young and later replaced with 800. Want to know about dyno test !!! even i am not clear of any privately owned Dyno testing facility in india as its a very costly equipment. It gives a collective details of the vehicle in a single go. It gives Specific Fuel Consumption, Max torque, power, deceleration curve etc. In AshokLeyland we call this as Roller Test Bench where in we test the complete vehicle dynamic performance including the above mentioned parameters. The vehicle can be accelerated upto 120KM in stand by condition and brought back to Zero.This test completely eliminated the actual road test of the vehicle.